A couple of people I know worked on a multi-part series that premieres on PBS this week. 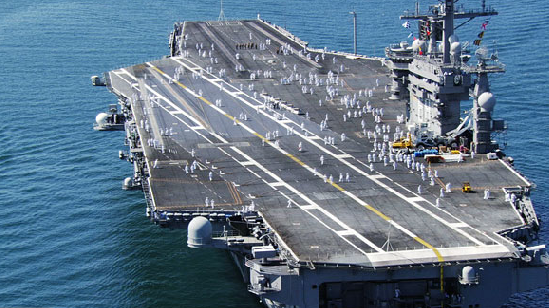 It’s called Carrier, and production crews spent six months on the USS Nimitz, a nuclear-powered aircraft carrier that deployed to the Persian Gulf in 2005. The editing took two years to complete. Judging from the first two hours which showed last night, it is an extraordinary effort, beautifully shot and well told. Seeing the amazing imagery in vivid high definition and observing how the producers found characters that represent the various strata of the floating population of 5,000 crowded into a ship 24 stories high, I was reminded of my own experience on aircraft carriers. For CNN, back in December of 2001, I spent a week and a half on the USS John C. Stennis (named for an Alabama senator, the only carrier in the fleet named for a senator, the others are named for presidents, an admiral, a member of the House and the site of the first airplane flight). I produced an hour-long documentary called Carrier at War with correspondent Frank Buckley. That was my first trip to the Middle East (the US Fifth Fleet, where we caught the flight to the carrier, is based in Bahrain) and my first coverage of the military. As followers of my career know, it would be the first of many. Several months later, for a documentary on military aircraft called War Birds, I visited the USS Abraham Lincoln, which was first to deploy a squadron of the new class of Navy fighter jets – the F/A-18E Superhornets. For that show, I got shots of carrier landings from a helicopter. I was strapped in a harness, my feet dangling over the Pacific Ocean, as I shot out the open side door of the chopper. And I also sat next to a sound man who had a fear of flying and threw up on the short COD (carrier on-board delivery) flight and carrier landing, which jerks to a halt when the tail hook grabs the wire. With several hours to tell the story, Carrier appears to be a comprehensive — but still fascinating and gripping — story of a deployment of one of ten aircraft carriers in the American fleet. I’m looking forward to meeting more of the thousands of the Nimitz crew who support the 4.5 acres of flight deck and the dozens of aircraft of Carrier Air Wing 11.